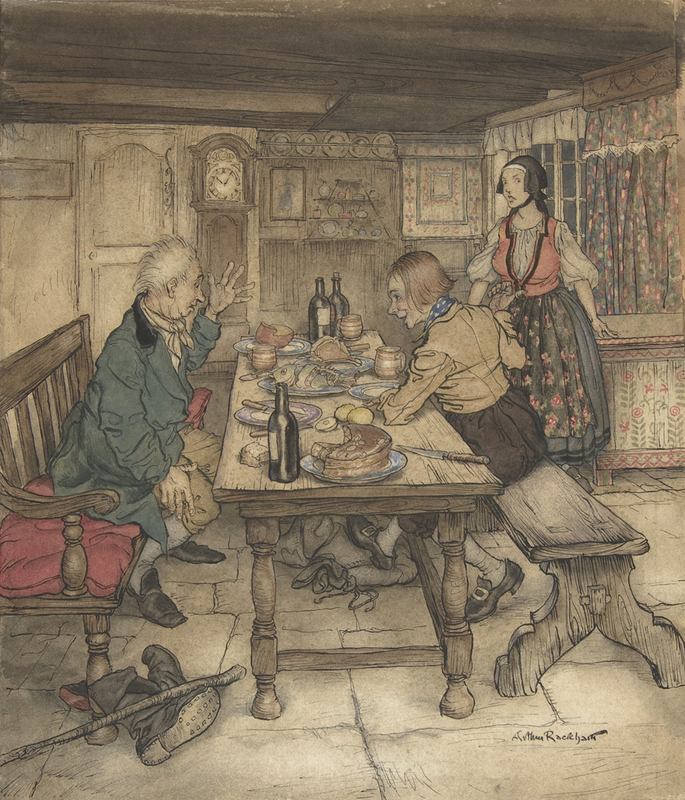 Rackham's great success as a children's book illustrator was founded both on his whimsical imagery and understanding of the new four-color printing process. Since the latter could effectively translate only a narrow range of hues, the artist worked in muted tones to ensure the faithful reproducion of his watercolors. Often, he made drawings much larger than the related illustrations and sold them as independent works. This image relates to Hans Christian Andersen's “Little Claus and Big Claus,” published by George G. Harrap & Co. in 1935 (MMA, 1986.1145.11) a fairy tale in which Little Claus revenges himself on a cruel fellow villager Big Claus, and here is shown tricking a farmer's family to procure a lavish meal. The donor acquired the watercolor from the artist two years after its publication.